This charming three bedroom holiday villa benefits from a tranquil location within a residential area, just 1.5km from a pretty, pebbled beach. This charming three bedroom holiday villa benefits from a tranquil location within a residential area, just 1.5km from a pretty, pebbled beach. It is well-equipped for a relaxing holiday and includes a covered terrace area, an outside swimming pool and a pool house. Inside, the holiday home has been tastefully decorated with carefully selected accessories and comfortable contemporary furnishings. The ground floor is home to the cosy living room, which opens onto the pool area, as well as the kitchen, which leads to the conservatory. 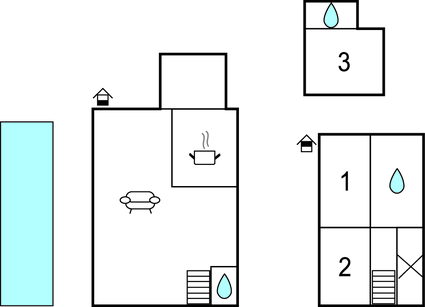 Upstairs, there are two bedrooms, one of which has its ensuite bathroom. There is also a quaint, wooden chalet, complete with an air-conditioned room outside. The holiday home is well located for guests wishing to explore Antibes, which is less than 5km away. The ancient walled town is often considered to be one of the prettiest on the French Riviera: be sure to discover its charming Old Town, chic boutiques and wonderfully inviting restaurants. The beautiful La Garoupe beach is well worth a visit, with its fabulous turquoise waters less than 5km from the villa. Please note, one of the bathrooms is only accessible from the outside. The agent has rated it as a four star property so it is a well-equipped villa with above average furnishings. It is also great value for money. This villa has a private pool and is located in Les Groules-Les Breguieres, only 15km from Cannes. It is set in a good location, 5km away from a sandy beach. There's also a restaurant 1.5km away.